Karl Marx was the son of a wealthy Jewish lawyer who had converted to Lutheranism. Karl was born in the Prussian-ruled city of Trier, in the Rhineland near Luxembourg and France. He was brought up in the tradition of the Enlightenment. 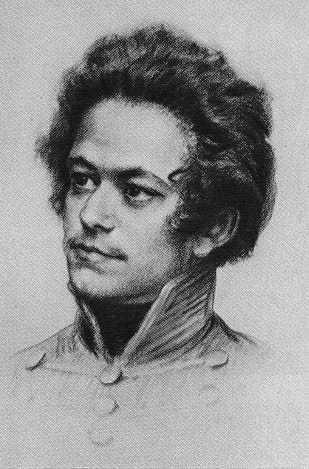 A contemporary drawing of Karl Marx as a young man. Marx studied philosophy at the University of Bonn. As his graduate essay he wrote that human nature was such that a person could achieve fulfillment only by working for the perfection and welfare of others. He pursued post-graduate studies at the University of Berlin beginning in 1838 at age 20. He joined those who admired Georg Wilhelm Friedrich Hegel's philosophy regarding social change and history moved by conflict. Prussian authorities were afraid that these Hegelian youths might apply the idea of change to the monarchy to which they were attached. And Marx did see in Hegel the possibility of political revolution. Marx won recognition as a sharp participant in the debates in coffee houses and beer halls in Berlin. While at the University of Berlin he took only two courses. One was taught by Bruno Bauer, a Hegelian who worked in Biblical criticism and argued that Jesus was a historical myth. Hegel (1770-1831) viewed God as directing humanity's conflicts, but Marx and his Hegelian friends put a twist on Hegel. They saw people as able to choose their own course rather than God choosing it for them. Marx acquired a doctorate of philosophy at the age of twenty-three, and for his dissertation he compared the Greek philosophers Democritus and Epicurus. He entered the world of work as a journalist. His father had died three years before, in 1838, and Marx's mother remained tight with the family's money. Marx was hard pressed financially and still planning to marry the woman to whom he had been engaged since he was seventeen: Jenny, three years older than he. Jenny's father, Baron Ludwig von Westphalen, was a government official in Trier. Like at least a few aristocrats he was an Enlightenment liberal. He had been a friend of Marx's father and had taken a liking to Karl, and it was Karl who looked after him when he became seriously ill in December 1841. It was Baron von Westphalen who had introduced the young Marx to the idea of socialism – the socialism of Saint-Simon. The baron died in March and had left Marx with his approval to marry Jenny, but his great wealth and Karl's eventual marriage to his daughter would not free Marx from financial stress.